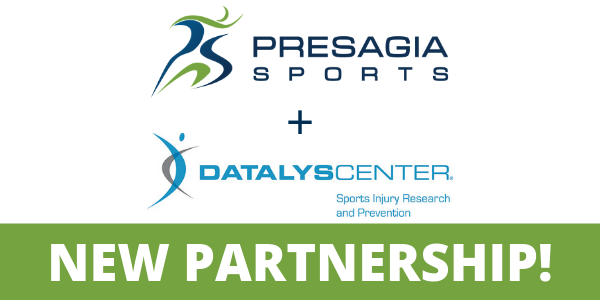 Presagia Sports is proud to announce a new partnership with the Datalys Center for Sports Injury Research and Prevention to improve sports injury research and prevention and simplify the collection of athlete data. Presagia Sports is a leader in Athlete Electronic Health Records (EHR) solutions, while Datalys specializes in epidemiological research that strives to make sports and other physical activity safer through data-driven research. The NCAA has contracted with Datalys to manage their Injury Surveillance Program; Datalys also runs the High School NATION program. Datalys currently manages data on injuries submitted by participating high school and collegiate sports programs across the United States. The data is used to conduct research into athletic injuries, which then informs programs and policies for managing and preventing injuries. Presagia Sports’ Athlete EHR is used by many collegiate and high school athletics programs to track and manage their athletes’ health data, including injuries, illnesses, treatments and concussions. Presagia Sports’ partnership with Datalys will allow Presagia Sports’ clients to more easily contribute data to ongoing surveillance programs. Through the use of Datalys’ “Export Engine”, Presagia Sports’ clients who participate in the NCAA Injury Surveillance program will be able to voluntarily submit de-identified data to Datalys while remaining HIPAA compliant. As a result, researchers and policy makers can benefit from a larger pool of centralized data, provided voluntarily by athletic trainers (ATs) in order to identify injury trends, mitigate future risks, and help ensure the well-being of athletes. ATs who are already participating will no longer need to double-enter their data. Presagia Sports will progressively rollout the ability to share data with Datalys starting in the Spring of 2019. Clients are encouraged to share their data to accelerate research and policy focused on the well-being and safety of student-athletes. To read the official press release for this partnership announcement, please click here.